Blue Cube Pools are an award winning pool installation company, we are exceptionally proud of our team for their achievements. From Gold award winning pools to Silver energy efficiency awards we strive to constantly improve and develop new and innovative ways to install swimming pools whilst offering exceptional value for money and environmentally conscious systems. Gold SPATA Award for residential outdoor pool under £40k. We are so proud to have won this award, the design specification was to develop and install a small family friendly swimming pool. What makes this pool unique are the double wide black copings which offered a visual illusion of space, the contrasting colours created a beautiful aesthetic and helped create a feature in the clients garden without dominating the space. The pool was unusually set at a 45 degree angle to the house, this was also used to create the illusion of size whilst mimicking the angular lines of the house. The pool equipment included a highly efficient inverter heat pump with exceptional c.o.p and outstanding pump and filter to ensure the water safety and clarity were maximised. 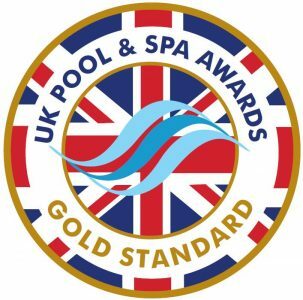 Gold UK Pool & Spa Award for pool technician, not only is our pool design and installation award winning, our engineers are too. They offer exceptional knowledge and help customers with a wide variety of issues from servicing, maintenance to new products. ISPE and SPATA approved engineers so you know you are in safe hands. Silver UK Pool & Spa Award for energy efficiency, this award was received for our design an installation for an exceptionally thermally efficient and environmentally friendly swimming pool. The client wanted a pool which would be extremely cost effective with low running costs, whilst being traditional and elegant. The customer had some very specific ideas and were so pleased with final results. Using exceptionally thermally efficient poly-blocks, a proflex reinforced liner, safety cover and an A rated heat pump we created a pool perfect for the customer and their needs. Contact one of team today and find out how we can create and award winning pool for you.